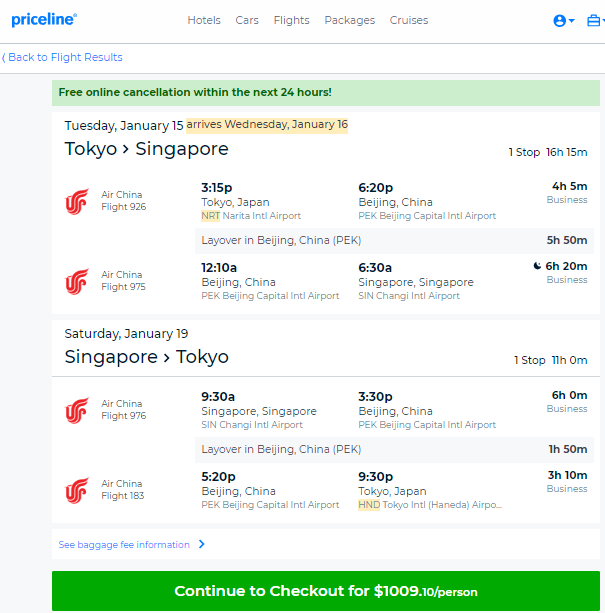 Today’s Airfare of the Day goes to Air China and their basic season business class excursion round trip fares between Tokyo and Singapore. Fare: Air China (CA) RLRFJP6 TYO to SIN. Price: from $1,006 ($848 base fare + taxes & surcharges). Seasonal restrictions: permitted 25NOV 18 through 20DEC 18 or 01JAN 19 through 29JAN 19 or 18FEB 19 through 15MAR 19 or 01APR 19 through 05APR 19 or 04MAY 19 through 16MAY 19 or 18SEP 19 through 04OCT 19 or 05NOV 19 through 19DEC 19 or 06JAN 20 through 16JAN 20 or 24JAN 20 through 25JAN 20 or 04MAY 20 through 19JUN 20 on the first international sector. Flight restrictions: travel must be on any CA flight operated by CA/ZH/NX. Advanced reservation/Ticketing restrictions: open returns not permitted. Stopovers: 2 stopovers permitted – 1 in each direction at JPY 5,000 each. Transfers: 2transfers permitted – 1 in each direction. Travel restrictions: valid for travel commencing on/before 31MAR 19. Sales restrictions: tickets must be issued on CA. Cancellations: charge JPY 30,000 for cancel/no-show/refund. 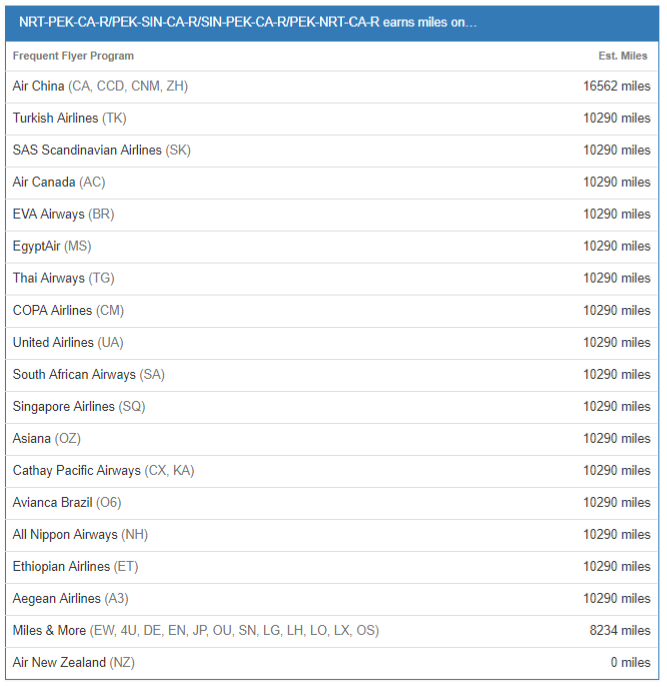 The following accruals were estimated using wheretocredit calculator for NRT-PEK-SIN round trip travel on CA marketed and operated flights without considering any elite status bonuses or ongoing promotions. Previous articleEnjoying Hotel Status Benefits After Checkout – Is It Worthwhile To Stay On Property When Departing Late?